Can we use the Internet and smart phone apps to support our inner life? This is why HeartSpace has been created. It is just one of the ways that we will build the virtual tekke (Sufi lodge), the inner, invisible environment where transformation is nurtured. HeartSpace invites us into ourselves, into that presence where the divine dwells. 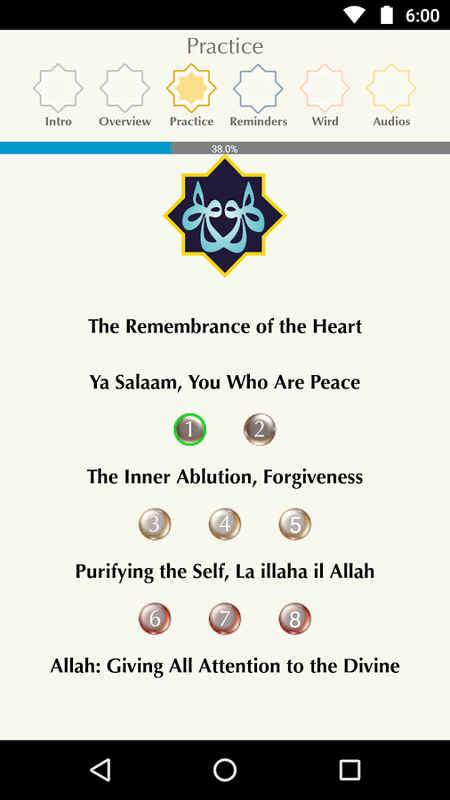 The first app to offer an experience of Sufi spirituality. Supports remembrance and presence with inspiring texts. Includes audio recordings of guided spiritual practices. A treasury of inspirational texts from Rumi, Hadith, and Qur’an sent as daily reminders. Set the time and frequency of reminders to bring remembrance into your daily life. The core of HeartSpace is a series of guided practices that should initially be followed in sequence, but eventually can be listened to in any order and as often as you like. The free app is complete in itself, offering a comprehensive and many-leveled introduction to the practice of remembrance, or zhikr as it is called in traditional language. Those who wish to continue and go deeper can subscribe to a version of the app that will offer further practices, more daily reminders, recordings of Sufi music and Qur’an, and the ability to connect with others engaged with this material. We have also included a program that allows you to receive daily quotes drawn from the rich treasury of Sufi literature, especially Jalaluddin Rumi, and from the primary sources of the tradition, namely, the Hadith and the Holy Qur’an. We have chosen these selections to be useful in supporting the development of your inner life. You can also choose favorite quotes, both as a personal record and to share them via email and social media. The purpose of HeartSpace is to awaken the consciousness of the heart through the wisdom and practice of Sufi spirituality. It is through the heart that a human being can experience the peace, inner strength and sense of well-being that comes through spiritual practice. True spirituality is based on experience more than beliefs. HeartSpace offers an introduction to traditional principles and practices shared across Sufi lineages. HeartSpace is not meant to replace lived spiritual guidance, but is intended to be an opening or a complement to your spiritual journey. All praise and thanks be to the Sustainer of the Universe.